A fix is needed to work on modern systems (see Network Edition Interoperability Patch). There is a launcher available courtesy of NightfirePC.com that adds a central way to view internet servers for SimCity (see SimCity 2000 Network Edition Launcher). This game has compatibility issues with modern versions of Windows. 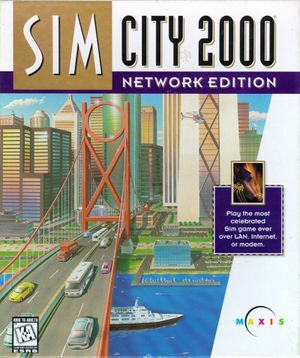 Download the SimCity 2000 Network Edition Interoperability Patch. Extract it somewhere convenient (the game will be installed within this folder). Run _setup.cmd and follow the steps. The Interoperability Patch can use a retail CD or download the trial version from the internet. Refer to the reddit thread for further details. This launcher allows players to view a list of servers like modern games and host their own server so people on the Internet can see and join it. Download the Network Edition Launcher. Extract all files to the 2knet folder where the game is installed to, overwriting any existing files. Note: the included 2KServer.exe includes the server send data rate fix. Run SC2KNEL.exe to host and play the game from now on. City files (*.scx) can be saved anywhere. On/off only (set in Options menu). UPnP is added by the Network Edition Interoperability Patch.